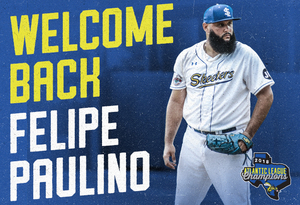 (Sugar Land, Texas, April 12, 2019) - The Sugar Land Skeeters today announced that they’ve re-signed Atlantic League All-Star and former Major Leaguer, Felipe Paulino. Paulino, 35, will be entering his third season with the Skeeters and his 16th at the professional level. Paulino set the Skeeters single-season record with 33 saves in 2018, which also led the Atlantic League, going 2-2 with a 1.18 ERA in 54 appearances. His 1.18 ERA was the lowest of any pitcher in the league with at least 50 innings pitched and his 72 strikeouts were the most of any pitcher with fewer than 60 innings pitched. He was selected to the 2018 Atlantic League All-Star Game and was also selected as an Atlantic League Post-Season All-Star. Paulino ranks second in Skeeters history with 49 career saves and is eighth all-time with 93 appearances. He first joined the Skeeters in 2017 and led the team with the 16 saves that year. He made 23 appearances in the 2018-19 offseason with the Cardenales de Lara, who were the champions of the Venezuelan Winter League. The Houston Astros originally signed Paulino in July 2001 as an amateur free agent from Venezuela. He made his Major League debut with the Astros in 2007 and appeared with them from 2009-10 as well. Paulino has also appeared at the Major League level with the Colorado Rockies (2011), Kansas City Royals (2011-12) and Chicago White Sox (2014). He’s 13-34 with a 5.22 ERA in 97 games at the Major League level (403.2 IP). Paulino last appeared at the affiliated level in 2016 with Triple-A Columbus (Cleveland Indians). Through 16 professional seasons, Paulino is 57-100 with a 4.60 ERA and 66 saves in 437 career appearances (191 starts), spanning 1,243 ⅓ innings pitched. The Skeeters, winners of the 2018 Atlantic League Championship, open the 2019 season on April 25 at Constellation Field against the Southern Maryland Blue Crabs. Individual tickets, season tickets and mini plans for the 2019 season are currently available and can be purchased by visiting sugarlandskeeters.com, the TDECU Ticket Office at Constellation Field or by calling the Skeeters at 281-240-4487. Visit SugarLandSkeeters.com and follow us on Facebook, Instagram and Twitter (@SL_Skeeters) for all the latest team news and the latest on events to be hosted at Constellation Field. With eight teams in Texas and the Mid-Atlantic, the ALPB is a leader in baseball innovation and a player gateway to Major League Baseball. Through its exclusive partnership with MLB, the Atlantic League tests Major League Baseball rules and equipment initiatives. The Atlantic League has sent over 900 players to MLB organizations while drawing more than 40 million fans to its affordable, family-friendly ballparks throughout its 22-year history.